On this blog I do not often write about me visiting breweries. Hardly ever, actually. Not that I hadn’t wished to take a look around in a Medieval gruit house, in an eighteenth-century mol brewery or at De Kraan en de Drie Snoeken in my home town, but that time machine still has to be invented. Luckily, the next best thing has just opened in Amsterdam. Not just another hip brewery just outside the city centre, it’s more than that, or at least if you are slightly nuts about historic beer. The name Van Vollenhoven doesn’t ring a bell with many Dutch people. Neither does De Gekroonde Valk (‘The Crowned Falcon’). Yet, these were the trademarks of what was one of Holland’s biggest breweries at the end of the nineteenth century. De Gekroonde Valk, operating since 1733 on the Hoogte Kadijk in the eastern part of Amsterdam’s city centre, produced huge amounts of stout and princesse beer. When modern times forced them to, they also made lager beers like pilsener, munich and bock beer. Over time they were however outcompeted by other breweries, among which their Amsterdam colleagues Amstel and Heineken. Next, the Second World War spelled doom for this export-oriented brewery. Production ceased in 1949. De Gekroonde Valk’s pride and joy, the Van Vollenhoven Stout, continued to be produced however, first by Amstel, and from the seventies onwards at Heineken. During the sixties, the export brand ‘Falcon’ was even licenced to competitor Oranjeboom, for the Mediterranean market. In 2003 however, the Van Vollenhoven Stout was discontinued by Heineken. End of story? Not really. 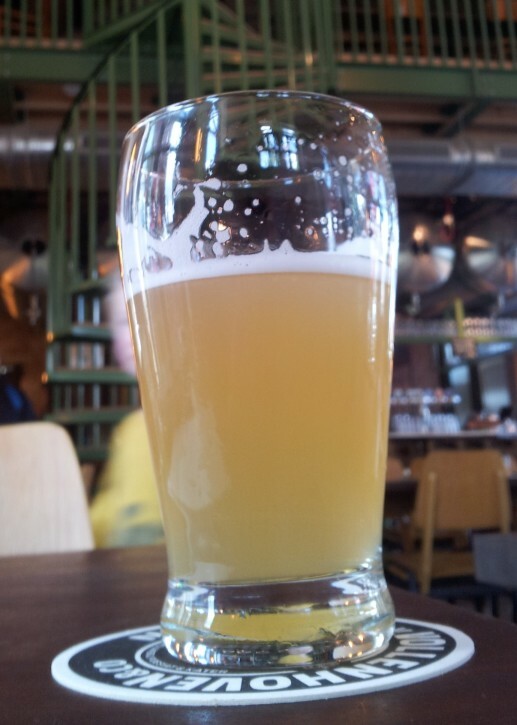 Because now I was sitting here, on a Tuesday afternoon, in the Poesiat & Kater brewpub in Amsterdam. 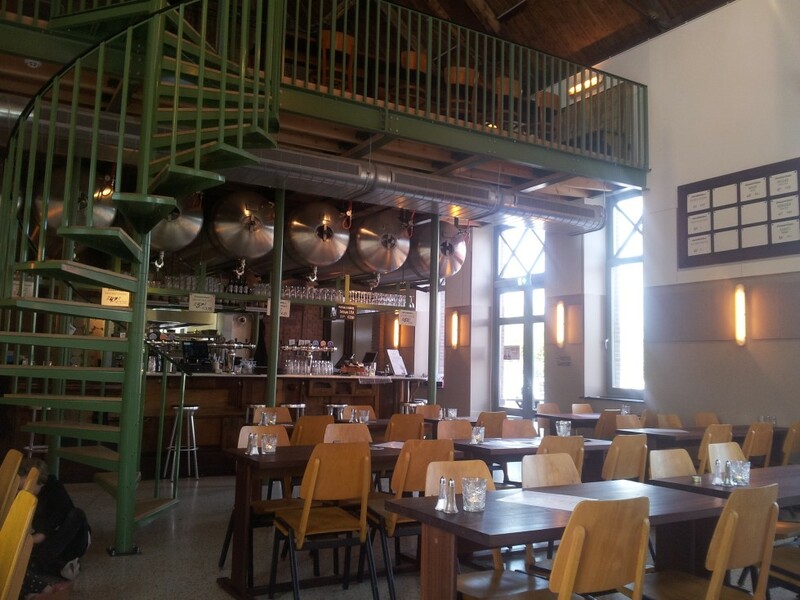 An attractive nineteenth-century building, once the ammonia factory of Amsterdam’s Eastern Gas Works, completely renovated inside and out. A slightly Spartan furnishing, brewery memorabilia decorating the walls. 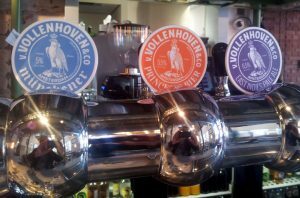 And on draught there are no less than four historic Van Vollenhoven beers, brewed on site in the adjacent brewhouse. The former Gekroonde Valk brewery was enjoying a modest comeback for at least some time: an old column with a falcon statue was unveiled on the original brewery site in 1993, and in 2006 the Van Vollenhoven Stout came back on the market, brewed according to the original recipe by local enthusiasts. The same enthusiasts are also behind this new brewpub, albeit with some new extra people on board. Such a resurrection begs to be accompanied by old beers, and for this I was able to supply them with some historic recipes last year. Not from the Gekroonde Valk, because those recipes are all lost except for the stout, but for similar nineteenth-century beers. Brewer Julián Álvarez Zárate has used them as a starting point for his reconstructions. And thus I was able to do a mini-tasting of historic beers last week. To be honest, a few years ago I could never have guessed that one day I would be able to drink a princesse beer on draught. 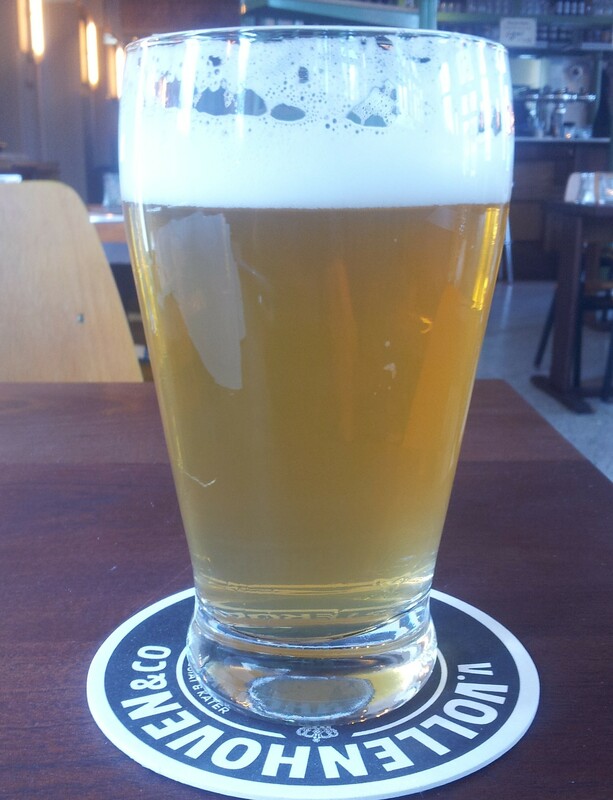 At Poesiat & Kater (named after two 19th-century brewery workers) it has become a blonde beer of 5,5% ABV. Historical princesse beer could be either light-coloured or dark. Julián’s test brew was a bit orangey to my taste, but the current version is much better balanced. He has turned it into a wheat beer, spiced with the typical princesse spices. The Weihenstephan-type yeast makes it a rather dry beer, like a nice summer drink. When the brewery opened on 23 March this year, they had already run out of princesse: during the previous two weeks, the pub was already open and the princesse had sold excellently. On draught there was also the East India Pale Ale, an allusion to the huge amount of beer exported by Van Vollenhoven to the Dutch East Indies in the eighteenth and nineteenth centuries. I had supplied Julián with a recipe for ‘Oost-Indisch’ beer (soon available in my new book in Dutch), in which it was aged for eight to twelve months in barrels previously soaked in juniper berries. The Poesiat & Kater version however is young, about six weeks old. A bit like it would have tasted in Holland before being exported. 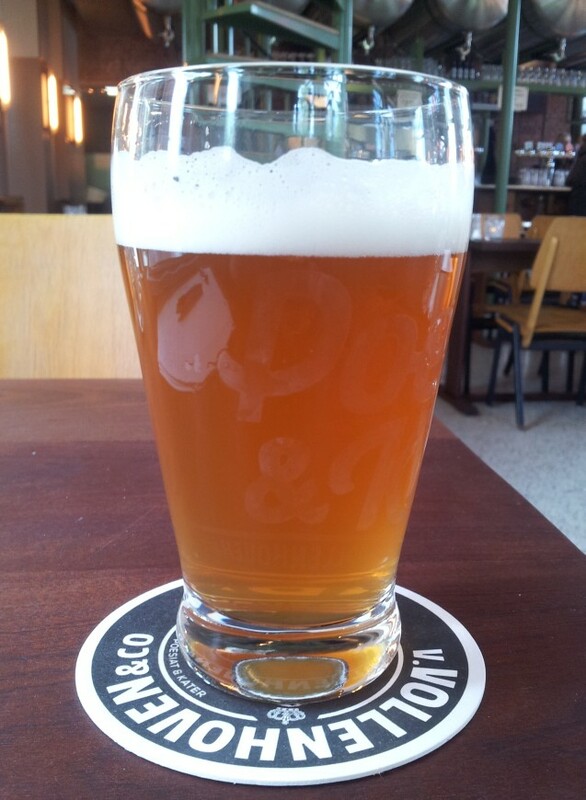 It has become a light-coloured hoppy beer, a bit like a strong IPA. Brewer Julián is however not completely satisfied, so he’s going to experiment some more with those juniper berries. To be continued! Last, there is the good old classic, the acclaimed Van Vollenhoven Stout, a great, full-bodied black beer. I’m proud to announce that the gentlemen of the Gekroonde Valk Foundation have allowed me to put a recipe of this great beer in my upcoming book, including its complicated brewing scheme! However, the best thing of Poesiat & Kater is to see how well these classic four Van Vollenhoven beers go together with a varied range of international beer styles, because they also offer a porter, pale ale, gose and triple on draught. The old Dutch beers, that incidentally often have international roots too, really offer a substantial enhancement to the beer menu. That’s historic beer at its best. It’s perfectly OK with me if they are not rigid reconstructions, old beers can also serve for new creative beer ideas. Hopefully, this is just the beginning. Just bought a Falcon Pilsener sign that originated in India .Circa 1930s . It’s the Amsterdam beer. Still in alright shape bit of rust & a few dents .